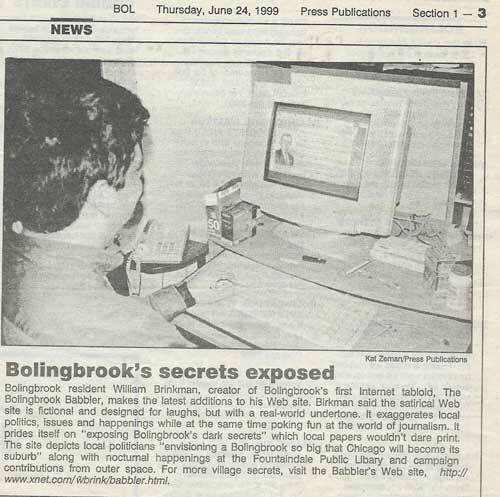 Twenty years ago this month, I was renting a basement room in Bolingbrook, not far from Mayor Roger Claar’s home. At some point during the evening, I wondered what writing a Weekly World News style tabloid would be like. So I wrote a story, added some HTML tags, and uploaded it to my personal web page. Despite what a certain podcaster believes, the Babbler really does date back to the 1990s. I didn’t realize it at the time, but I had written the first story of what would become the Bolingbrook Babbler and the start of the most extended writing project of my life. In the fifteen years I’ve actively been publishing, my stories have been praised by a Congressman, Bolingbrook politicians, and residents in the western suburbs. Being accepted into the Freethought Blogs network was a great honor and a reflection on my stories. When I started writing the Babbler, two of my interests were secular issues and speaking up about Roger’s near-total rule of Bolingbrook. I became active in the skeptical and atheist movement and gained some notoriety. Some of my heroes at the time, including James Randi, praised my work. When the great rifts started, I was surprised to learn that many of the people I had admired in the skepticism had views I found abhorrent. I may have lost some readers when I drifted away from the community, but I rediscovered humanism. Once I was mildly critical of PZ Myers. Now I’m proud to be a part of the network he helped create. Roger is still the Mayor of Bolingbrook, but now a member of the opposition party sits on the Village Board, and the Bolingbrook United party will be running a full slate in the April elections. Bolingbrook residents finally have a choice at the ballot box for local elections. Over the years, I’ve had some friendly meetings with Roger and some tense ones. I’ve also received a couple of midnight emails from him. I recall looking at my analytics program and realizing that someone from the Village Hall network went through almost every page of the Babbler. (Somehow, a person from California managed to access the village network to view my pages.) Today, I think we’ve learned to co-exist. Still, the memory I will have of him is from a speech he made after winning a recent election by roughly 150 votes. He divided Bolingbrook’s voters into “residents” and “foes.” Instead of choosing to heal the wounds from that election, he sought to delegitimize his opponents. It’s been an adventure, and I suspect there are more adventures ahead. President Trump and his fellow authoritarians are threatening the pillars of our government. They are going so far as trying to delegitimize the last election. The next election in Bolingbrook could be between those who want to be the next Roger Claar and those who wish to end one-party rule altogether. Plus, there are lots of stories going on in Chicagoland, not just Bolingbrook. I also want to thank my wife, who wishes to remain anonymous on these pages, for her help, her support, and for putting up with my writing schedule. I love her, and we make a great team. To my fans, old and new, I say thank you for your support, and I hope to keep writing the Babbler for at least another twenty years. Although I may no longer live in Bolingbrook, I feel like part of me never left. Woo hoo! 20 years is longer than most marriages and many careers. Happy Anniversary.